You know how things can seem really promising, and then, after a lot of excitement and anticipation, they just don't pan out? Like when you look back over what was supposed to be a lavish, exhilarating, fulfilling summer and see that, even after all that planning, you just spent too much time on the couch wishing for air conditioning, you forgot about the cardamom-ginger pie crusts and left them in the oven all day, your washing machine still isn't working after four months and eight visits from the repairman, you look fat in all your beach pictures, your bank account is empty, your food photos are all coming out like crap because you don't have a decent way to light them, you boiled spaghetti in forty dollars' worth of Chianti but added too much water so it came out grey, you can't afford a pedicure to make yourself feel better and apparently after graduating from college you're underqualified to be a waitress in New York City? Well, that's sort of like dragonfruit - lots of exotic, hot-pink promise; tastes like an over-ripe kiwi from WeightWatchers. But - when life gives you bland, mushy dragonfruits...make key lime pie with a stiff layer of sweet meringue. And potpourri. Beat egg yolks with electric mixer until thick and light yellow, about 3 minutes. Add sweetened condensed milk. Stir in half of the juice until blended. Add remaining juice and blend in. Pour mixture into pie shell. Beat egg whites and cream of tartar with electric mixer on high until stiff peaks form; add sugar and beat just until combined. Spread meringue over pie filling, making sure it touches the crust on all sides. Bake at 350 degrees for 12 to 15 minutes until set. 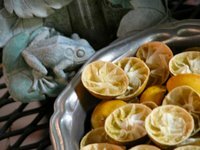 Let cool to room temperature; chill and serve, garnished with twists of candied lime zest. Spread your leftover key lime rinds on a baking sheet and dry them out in the oven at 150 degrees for four to five hours. They make the kitchen smell lovely and are a beautiful addition to a bowl of potpourri. Now, maybe not all dragonfruits are bland and disappointing; I've only tried it once, after all. Maybe I just haven't learned how to single out a ripe, sweet dragonfruit yet. But I'm a very competent slice of pie if I do say so myself, and I'm sure I'll get it right the next time. Crossing my fingers for autumn. I love the pie and potpourri pictures! You just needed a little time and less than 20 people around who wanted to eat what you were photographing! Good to have you back at the key board! ....lucky, lucky will be your new employer!! I love the idea of the lemon rinds - I must try it. This is my first time visting your blog, love your writing and pictures ! The key lime pie looks delicious, specially this time of the year, and I hear you when you talk about let-downs, be it exotic looking fruits or exciting looking summers! Thanks for sharing. what a beautiful pie! and yes, i know that feeling of having a summer-long to-do list of wonderful things that just don't all seem to get crossed off to my satisfaction. but fall is the season for new beginnings is it not? best of luck. tanna - thank you! using an electric juicer really helps the aesthetic of the rinds - they don't get crushed, and all of the inner folds spiral in the same direction. connie - thank you. i'm a big proponent of new beginnings, myself...just trying to get this one off on the right foot! helios - i love when you comment because you're always such a good pick-me-up =) I found my first dragonfruit in a Publix in Atlanta, of all places...but I've seen them subsequently in Chinatown. 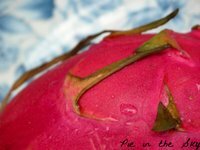 they do have other aliases, which can be confusing: pitaya, pitahaya, or strawberry pear. Thanks for visiting my humble bit of espace. Sorry to read about your summer--I think something's going around...there seem to be a bunch who've had less-than-spectacular summers. This Tennessee Aunt has never seen or heard my Georgia Fairy so blase on her blog----You are in transition ----- HOLD ON -- BIG things are going to happen.---Employers will never be sorry!!!!! WHAT An AWESOME PIE!!!!! Becca and I showed her mom and grandma your blog today, and we all agree that you need to do something with cooking and culinary writing in your life... because you're so damned good at both! I love you SO much, and miss you! Also, my dad and I tried dragonfruit once, and you're description of it being a Weight Watchers kiwi was perfect. I'm with you on the less than stellar summer, it happens. Loved the comment from your mom, I am figuring out myself what I don't want to do and focusing on what drives me and fulfiils me as well as the people I care about. 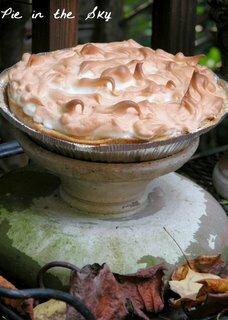 You and I were on the same wave length: check out the lemon meringue pie on my blog, and I was "that" close to get a dragon fruit at the store today. Glad I did not! Yay! You're back! I was so looking forward to the new recipes! Hi Kate! Thanks for keeping the summer alive for me a little more with this Key Lime Pie recipe; oh how I long to be back in Key West! Hi Kate, glad you're back. Best wishes, and thanks for the tip about "roasting" the key lime rinds. Great idea. I echo everyone else's sentiments. I'm glad to see you back blogging and here's hoping Autumn brings you many beautiful things! Where does the time go, anyway? Summer is ovah. Oh, I have never had a delish dragonfruit before altho the people around me always seem to enjoy them. I usually slice up the fruit and blend with soy milk. It makes a really thick and yummy smoothie. Try it! LOL. So glad I saw this! They are for sale in the local market, and I hesitated, not knowing if they would be worth the steep price. Thanks for the heads up! a really good dragonfruit shouldn;t be mushy. my brother's friend grows and exports dragonfruit. To try it at its peak is a revelation! Try to pick firm ones, not soft or they are over-ripe. It should have a nice bite and crunch. 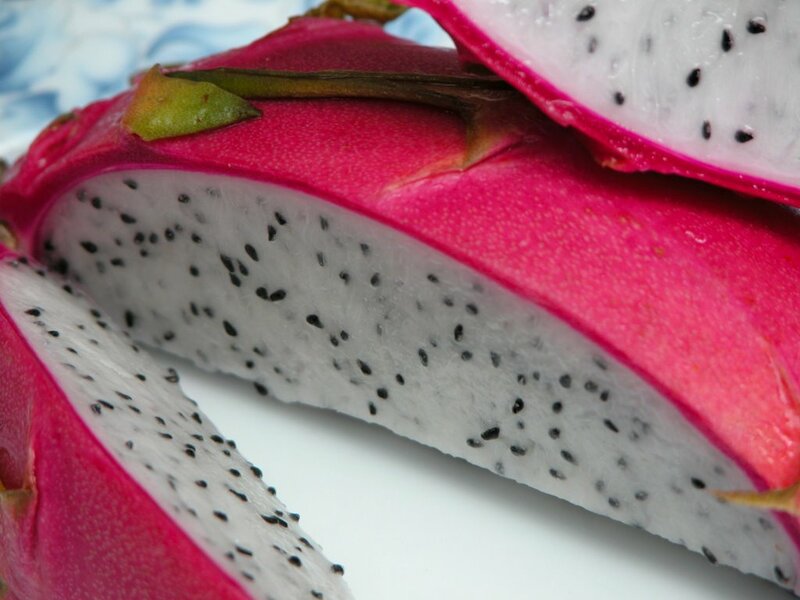 The scattered seeds are a welcome addition to the overall sweetness and firm texture of dragonfruit. Every year we look forward to dragon fruit season. We love it! Just found your blog; I hope by now you've had a nice, yummy, juicy dragonfruit. They really can be delicious, but I don't know how to choose them, either. I just ask the nice men at the fruit stands in Chinatown to pick them out for me, and they've never let me down. I'm sorry to hear that the dragonfruit you tried wasn't as great as you thought it would taste. Might I suggest you try the other kind? It's purple in the middle instead of white and has a much more sweeter taste to it. I admit it's harder to find anywhere than Asia, but there are some places that have it. I grow both kinds of dragonfruit in my backyard, but I have to admit I prefer the Purple one over the white. I hope that once you try the purple dragonfruit it will change your opinion for the better. I can say that this fruit is good for dieting, although I don't like the taste. My girlfriend usually eats this. She has started loving veggies and fruits after she underwent breast augmentation and lipo at Tampa. Well, the procedure truly benefits her because she's obviously sexier. I am really curious with the taste of that fruit. thanks for sharing, I will try to do this.